While seeing tiny kids wearing too-large backpacks is adorable, parents know that it isn’t really ideal. Lone Cone knows this too, which is exactly why they created backpacks designed to fit little explorers. Lone Cone’s backpack lineup comes in several bright, adorable patterns like campfire critters and space cats, so your little one can choose a backpack fit for their size and personality. Each bag has a sleeve for tablets and multiple pockets for snacks, toys and treasures. Wherever adventure takes you this summer, Lone Cone’s backpacks will surely hold all your little explorer’s essentials, and they’ll be able to carry it all by themselves. Timing: The Sweepstakes begins on June 27th 2018 at 12:00 p.m. Mountain Standard Time (“MST”) and ends on July 4th, 2018 at 11:59 p.m. MST (the “Promotion Period”). Administrator’s computer is the official time-keeping device for the Sweepstakes. ii. Locate the @testedinidaho post announcing the Tested in Idaho Gear Pack Giveaway and post a comment tagging three (3) friends; and adding the designated hashtag, #TestedInIdahoGiveaway” in the same comment. Prizes: One (1) prize pack will be awarded. 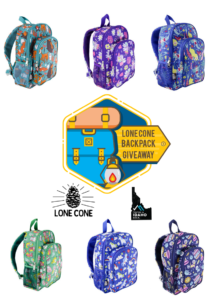 The prize pack consists of a pair of Lone Cone Backpack. The prize will be awarded no later than July 25th, 2018, subject to change. Approximate Retail Value (“ARV”) of prize, subject to change: $30.00. The prize is non-transferable and no substitution will be made except as provided herein at the Sponsor’s sole discretion. Sponsor reserves the right to substitute the prize for one of equal or greater value if the designated prize should become unavailable for any reason. The prize is limited solely to the item(s) explicitly set forth herein and shall not include any and all other expenses, incidentals, taxes, or other costs that may arise out of the winner’s acceptance and use of any prize. The winner is responsible for all taxes and fees associated with prize receipt and/or use. Odds of winning the prize depend on the number of eligible entries received during the Promotion Period. Limit: One (1) prize per person. Additional terms and conditions may apply. © 2018 Idaho Department of Commerce. All rights reserved.